Exploration-like sightseeing is wandering around an unfamiliar place, and is a way of seeing sights and enjoying novel experiences that are not mentioned in guidebooks. However, the fear of getting lost prevents tourists from engaging in exploration-like sightseeing. 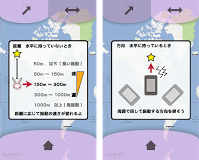 Current navigation devices are capable of providing effective routes to specific places, which is not compatible for this mode of sightseeing. This is because tourists tend to focus on the recommended route displayed on the device and follow it faithfully. This prevents tourists from seeing surrounding sights. Here, we propose a new navigation method called stravigation. Stravigation is a vibrotactile mobile navigation for the tourist to be able to enjoy exploration-like sightseeing. We describe its basic concept and the results of evaluation experiments. These results show that stravigation is capable of guiding tourists to specific places correctly without the need to watch navigation devices. Furthermore, the results also show that stravigation enhances the sense of delight while wandering.